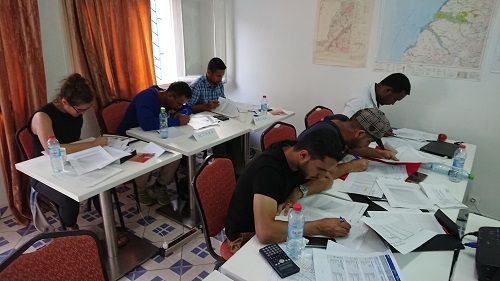 We have just completed one session of our Technical Training in Water Infrastructure, organized in Antananarivo, Madagascar. The next session will be held from 02 to 07 of September 2019 in Antananarivo again. Application is open. Besides this, we will run two other sessions this year for ICRC staff in Nairobi, Kenya. Staff members at BushProof have recently been introduced by the manager to the LEAN Management (Six Sigma) method. Various good practices aiming at improving the profitability of the company’s operations and the working improvement of the employees are currently being put in place. Improving production sometimes involves a simple change in the work routine. This is the case in the Canzee hand pump production. BushProof has just completed a detailed hydrogeological study on the east coast of Madagascar, in order to highlight the options of groundwater abstraction on a site and the related risks. Various methods and tools of the hydrogeologist have been used, including the drilling of observation wells, a monitoring of the piezometry and hydrochemistry, extended pumping tests, as well as a geophysical exploration. All that has allowed us to describe the local groundwater system with precision. We have been offering this service for several years now and are happy to continue to give satisfaction to our clients while improving our knowledge of the groundwater of the country. BushProof is currently conducting field surveys under the RANOWASH project. This $ 30 million USAID-funded project is being implemented by a consortium formed by CARE, CRS, WaterAid, BushProof and Sandandrano. For the next five years we will work on the implementation of water supply systems in remote areas of Atsinanana, V7V and Aloatra-Mangoro regions. Within this program, we wish to contribute to improve the technical approaches traditionally followed by the WASH sector. BushProof is working alongside with Primary Water Technologies (PWT) and Lanoé Forages on an innovative exploration and water prodution project fund by UNICEF in the South of Madagascar. An international team is mobilized (USA, Russia, Germany, Madagascar, Switzerland) with modern exploration means (radiometrics and passive seismic) allowing to “mine for water”. The objective is to locate and tap upwelling of primary water through deep fractured zone.